This is the recipe that based on my father's cooking for Ji Yu (carp) in China, a traditional Chinese family dish, using his Sichuan style cooking. 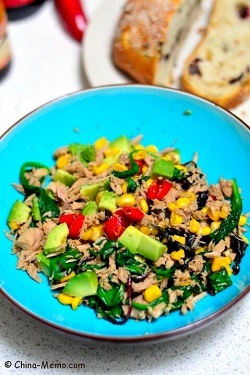 My first attempt to make a tuna dish, Chinese Spicy Tuna Veggie, which turns out to be surprisingly good. Less than 15 minutes to make, less than 300 kcal. How good is that! 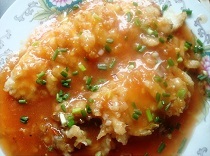 Chinese fish recipe from my mother’s home cooking, where her homemade dipping sauce make the fish fillets taste special. A quick easy Chinese microwave oven fish recipe for Chinese style cod. 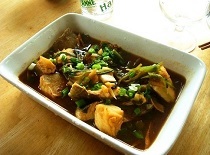 Instead of frying pan or wok, microwave oven can cook the fish perfectly. Simple and healthy. In China Hunan province, the local-made lobster dish is very popular at summer evening snack food street. It is hot and spicy, full of flavour. 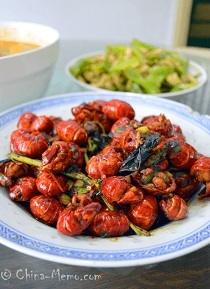 This is our family version of Chinese spicy lobsters. 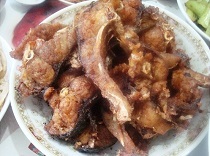 Here is my mother’s home cooking for Chinese Pine Nut Fish (carp). 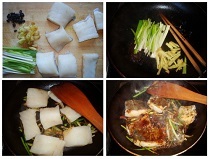 The fish fillet is cut diagonally, after frying, the surface looks like pine nut so is the name “pine nut fish”. 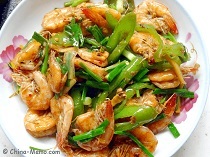 This Chinese spicy shrimp recipe is based on our family cooking for Jinga shrimp. In Chinese it is called Jiwei Xia (基围虾). We cooked the shrimps with green chili and ginger, seasoned by a special Chinese hotpot sauce for lobsters. Prefer healthier style cooking? 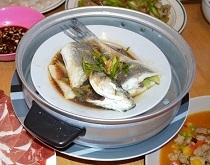 Perhaps you can try this Chinese steamed fish recipe. Really simple and easy to make, fresh, tasty and healthy too. 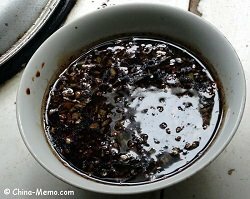 My recipe for oven cooked Chinese style cod. 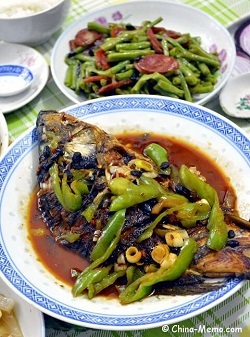 Instead of frying the fish, I use oven to cook the fish and add the Chinese sauce on the top. My cooking adapted from my father's Red Cooked Carp recipe, so that the cod fillet I cooked in the UK can still have some taste of my father's Sichuan style dish.